Reverse description: Horse facing right, double tail, star with open centre in front, pellet in ring(?) below. Curved pelleted motif with small pellet in ring above, pellet in ring(?) above tail. 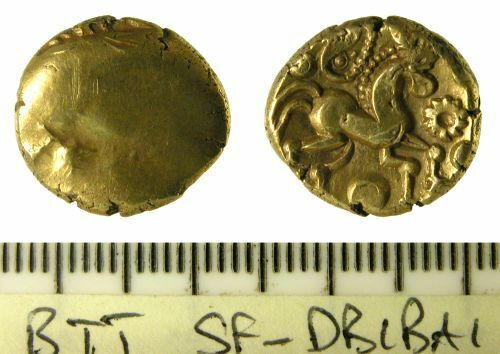 British Iron Age gold stater: Uninscribed British L (Late Whaddon Chase). VA 1502-1.